Q: Vice Premier Zhang Gaoli will soon visit Russia. Can you tell us more about that? Can we expect outcomes in investment and energy cooperation between China and Russia? A: At the invitation of the Russian government, Vice Premier Zhang Gaoli of the State Council will travel to Russia from April 11 to 13 for the fourth meeting of the China-Russia Investment Cooperation Committee and the co-chairs' meeting of the China-Russia Energy Cooperation Committee. The China-Russia comprehensive strategic partnership of coordination is in the best state ever. A series of positive results have been achieved as the two sides move forward practical cooperation in investment, energy and other fields. Steady progress in major strategic cooperation programs, in particular, has laid a solid foundation for the sound and stable growth of the bilateral relationship. Cooperation in investment and energy is an important part of China-Russia practical cooperation and also the most productive area. Vice Premier Zhang Gaoli will co-host the fourth meeting of the China-Russia Investment Cooperation Committee with First Deputy Prime Minister Igor Shuvalov, and the co-chairs' meeting of the China-Russia Energy Cooperation Committee with Deputy Prime Minister Arkady Dvorkovich. They will focus their discussion on China-Russia cooperation in investment, energy, finance and other fields for further progress. Q: I have a question on the Chinese citizen who was killed in Paris. The French Justice launched an official investigation yesterday. Is China satisfied with this new development? A: The Chinese side has been communicating with the French side about the Chinese citizen who was shot dead by the French police. We have repeatedly expressed our strong concerns, asking the French side to find out the truth as soon as possible, release the result of investigation, and respond to the bereaved family's legitimate requests. The French side has pledged to take this issue seriously, complete the investigation as soon as possible to inform the public of the truth and protect the safety of Chinese citizens in France. 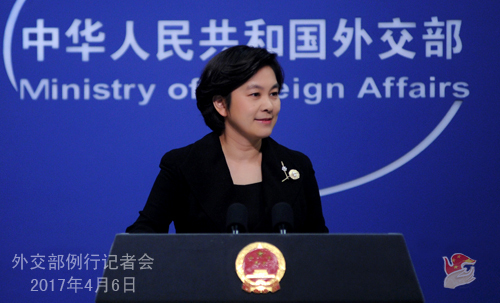 The Chinese Foreign Ministry and the Chinese Embassy in France will continue to follow the developments of the case, and ask the French side to properly handle the incident and safeguard the safety and lawful rights and interests of Chinese citizens there. Q: First, it is reported that US President Donald Trump has removed chief strategist Steve Bannon from the reshuffled National Security Council. What is China's comment on that? Second, according to media reports, China will go for other water dam and port cooperation projects in Myanmar after giving up the Myitsone hydropower station. Can you confirm that? A: I have no comment on your first question, as it belongs to the domestic affairs of the US. On your second question which is about the Myitsone hydropower station, a similar question was raised by the Reuters yesterday and I already gave the answer. China's position on cooperation projects such as the Myitsone hydropower station remains unchanged. We will stay in communication with the Myanmar side to properly address difficulties and problems emerging in the process of cooperation, and press steadily ahead with cooperation in the relevant field. It is conducive to local economic and social development, and also benefits people from both sides. Q: Some companies in Pakistan are criticizing China for charging too much for infrastructure projects along the China-Pakistan Economic Corridor (CPEC), specifically they are criticizing a high voltage transmission line that is being built by China State Grid. And China does not allow for competitive bidding on the Belt and Road projects there, which drives up costs. Do you have any response to that? A: I am wondering where did you learn that. It is different from what I know. We have been saying that the CPEC is a new cooperation framework established by China and Pakistan for long-term growth. Guided by the principle of extensive consultation, joint contribution and shared benefits, the CPEC is built in an open and transparent way with reference to international practices. It is carried out in a market-based manner with enterprises as the main players. We believe that the CPEC will contribute to the common growth of China and Pakistan, and interconnectivity and prosperity of the region as well. Q: Serbian Prime Minister Aleksandar Vucic has recently won the presidential election. What is your comment on that? What is your expectation for the development of China-Serbia relations? 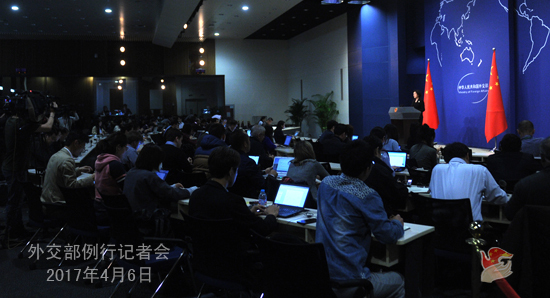 A: The Chinese side has taken note of the presidential election. The Chinese leader has sent a message of congratulations to President-elect Vucic. We could foresee constant new progress in economic and social development of Serbia under the leadership of Vucic. The Chinese side values its relationship with Serbia and stands ready to work with Serbia to consolidate traditional friendship, deepen mutually beneficial cooperation and further advance China-Serbia comprehensive strategic partnership. Q: You said yesterday that China would lodge representations with the Indian side about Dalai Lama's visit to the "Arunachal Pradesh". Can you now confirm that China lodged the representations? Can you tell us which Indian official received the representations? A: The Chinese side has lodged representations with the Indian Ambassador to China in Beijing, and the relevant official of the Indian Foreign Ministry in New Delhi. Q: US President Donald Trump said on Wednesday that the US would boost its military capabilities against the DPRK. Does China think this is conducive to the resolution of the Korean Peninsula issue? With regard to the suspected chemical weapons attack in Syria, UN Security Council members are discussing a resolution on that issue. The vote on the resolution may happen today. What is China's position? Will you support it? A: On your first question, China's position on the nuclear issue of the Korean Peninsula is consistent. The situation on the Peninsula is so complex that we can only realize long-lasting peace and security there by fundamentally resolving the nuclear issue with a holistic approach that addresses both the symptoms and the root cause. We will work together with all relevant parties to strive for a peaceful and proper settlement of the Korean nuclear issue through dialogue and make our due efforts for denuclearization of the Peninsula and enduring peace of the region. On your second question, Ambassador Liu Jieyi of the Permanent Chinese Mission to the United Nations has already made clear China's position on Security Council's discussion on the issue of chemical weapons in Syria. You can find his statement on the website of the permanent mission, and I will just leave it there. Q: The ROK media reported today that the ROK successfully tested a ballistic missile with a range long enough to hit any part of the DPRK. Do you have any comment on that? A: We have noted this report. The current situation on the Korean Peninsula is highly complex and sensitive. All parties concerned should exercise restraint, avoid provoking each other, make more efforts to ease the tension, and safeguard regional peace and stability, rather than the opposite. Q: Is China's objection to Dalai Lama's visit to the "Arunachal Pradesh" driven by the view that India is questioning the one-China principle by inviting the Dalai Lama? A: I want to stress once again that on major issues concerning China's territorial sovereignty and national security, China's position is consistent. The boundary question and Tibet-related issues bear on China's core interests. By extending an invitation to the Dalai Lama and approving his activities in the disputed eastern section of the China-India boundary, the Indian side has breached its commitment on Tibet-related issues, further escalated the boundary dispute, and undermined mutual trust and relations between China and India. 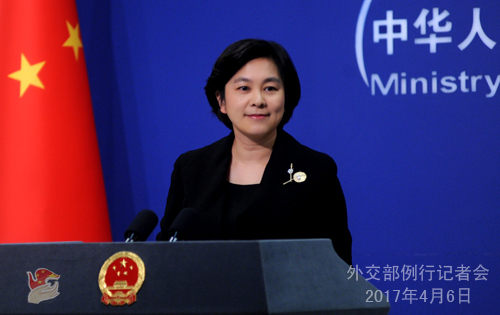 The Chinese side opposes the Dalai Lama's visit to the disputed area and any country's provision of venues for his anti-China separatist activities. As I have said, the Chinese side has lodged stern representations with the Indian side in Beijing and New Delhi respectively. We urge the Indian side to stop its erroneous act of using the Dalai Lama to harm China's interests. Q: In a telephone conversation with US President Trump today, Japanese Prime Minister Shinzo Abe said that China should play a major role in resolving the issue of the DPRK, adding that Japan was watching how China would respond to Pyongyang. How do you respond to that? A: We have stated time and again China's opinion on the current situation of the Korean Peninsula and our related stances. Located next to the Korean Peninsula, China cares more about the situation on the Peninsula than anyone else and is worried by the continuous escalation of tension. We hope to realize peace and stability there. China has long been making tremendous efforts for the settlement of the Korean Peninsula issue. We maintain that to fundamentally resolve this deep-seated issue we need to address both the symptoms and the root cause, as well as different parties' legitimate concerns in a comprehensive and balanced way. The Chinese side will work with all relevant parties to push for denuclearization of the Peninsula and lasting peace of the region. Q: According to the Russian media, Vice Premier Zhang Gaoli is going to meet with President Putin in Russia. Do you have anything to say about that? A: As I said, Vice Premier Zhang Gaoli will co-host the fourth meeting of the China-Russia Investment Cooperation Committee with First Deputy Prime Minister Igor Shuvalov, and the co-chairs' meeting of the China-Russia Energy Cooperation Committee with Deputy Prime Minister Arkady Dvorkovich. We have also noted the information from the Russian side about the meeting between President Putin and Vice Premier Zhang Gaoli. I cannot confirm that at the moment. China and Russia are comprehensive strategic partners of coordination. We will be glad if there is such an arrangement. The two sides are consulting with each other on the specific agenda of the visit. Q: You just said that other countries should respect China's core interests. Media reports say that the reason why India invited the Dalai Lama to the "Arunachal Pradesh" was because China did not respect India's core interests in issues such as joining the Nuclear Suppliers Group (NSG). What is your comment on that? A: We have unequivocally expressed our opposition to India's approval of Dalai Lama's activities in the disputed eastern section of the China-India boundary. We will not speculate about India's motive. What I want to stress is that India has violated its commitment on Tibet-related issues, fueled boundary dispute and hurt China's interests and China-India relations by arranging Dalai Lama's activities in the disputed eastern section of the China-India boundary in disregard of China's concerns. The Chinese side is firmly against that. Mutual respect and mutual accommodation of each other's core interests and major concerns serves as a foundation for the steady growth of China-India relations. The Indian side should honor its commitment, match its words with actions, stop its wrong moves and do more to increase mutual trust with China and safeguard the overall interests of China-India relations with concrete actions. As for India's application for the NSG membership, the Chinese side has elaborated on its position many times. It is a multilateral issue that should be resolved by all NSG members through consultation. The Chinese side supports NSG members in working out, on the basis of thorough discussion, a non-discriminatory solution that is applicable to all non-NPT states through open and transparent inter-governmental procedures.